Pool is a historic game that’s played on a global scale. To compete with friends or at a professional level, you need to keep your pool cue protected. This is made possible when you invest in a pool cue case. This accessory not only offers your pool cue adequate protection, but it makes it a breeze to transport from pool hall to pool hall. Today, there are so many choices to consider. What makes for the perfect pool cue case, though? Most pool experts agree that these factors determine the quality of a pool cue case: materials used, portability, affordability, and overall design. Taking these factors into consideration, the following pool cue cases have received the top reviews. All of them are stylish, feature a long-lasting design, and are priced fairly to work with whatever budget you have set. No matter what type of pool you plan on engaging in or how skilled or inexperienced you are, this list offers something for everyone. Billiard is a brand that is synonymous with pool, and you can partake in this long-standing tradition with the Iszy Billiard 1x1 pool cue. Featuring a hard shell, this pool cue case is extremely durable and provides ample protection once pool cues are secured inside. A vinyl wrapping gives the case extra style and comfort as well. Thanks to an adjustable shoulder strap, pool players can comfortably wrap this case around their shoulders and go on their way quickly. A novel feature of the Iszy Billiard 1x1 case is its storage pocket. It’s featured prominently on the side and gives you extra room for all of your pool essentials. These can include extra tips, pool chalk, and much more. The pocket even has a zipper to ensure every item is secure, even when you’re on the go. Transporting this hard pool cue case isn’t problematic in the slightest as it has a compact design. Measuring 31 ¼ inches in length, you can easily maneuver this case wherever your pool adventures take you. The compact design also makes storing this case extremely easy. One of the most important highlights of the Iszy Billiard 1x1 case is its affordability. It enables players to protect their pool sticks in a cost-effective way, yet they still get to benefit from of a quality brand that people know and trust. 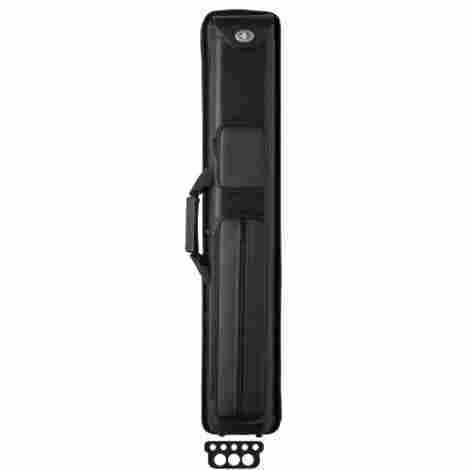 There’s no better way to transport your pool stick than in the Casemaster Deluxe pool cue case. It features a box shape that has been elegantly wrapped in hard-textured leatherette. The premium experience continues to the interior with fully-lined cushions. The provide pool sticks with maximum protection. A top handle makes transporting the case extremely easy and ensures a firm grip. When you’re on the go, you can effortlessly carry the Casemaster Deluxe thanks to a handle conveniently featured at the top. It provides users with a firm grip and is fully wrapped in a sophisticated leather. The Casemaster Deluxe is renowned for its supreme style. The unique combination of leather on the exterior meshed with red fabric liner creates an appealing aesthetic. The case also features a sleek design. Featuring a low price, the Casemaster Deluxe doesn’t put financial barriers on pool players looking to carry their pool stick in style. For it’s value and durability, this box-shaped case has no equal. It excels in function, aesthetics, and quality. If you have multiple butts and shafts to store, the Elite Nexus Original is the go-to pool cue case. Featuring an oval shape, it comes with a carrying strap and handle to accommodate you wherever your pool adventures take you. Durable plastic is featured on the exterior, while the interior has rubber molding. 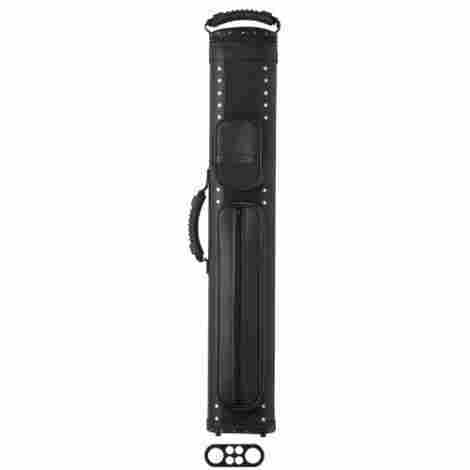 Pool shafts can be inserted in either direction – making it a diverse pool cue case to own. No matter what pool stick you have, you can rest assured it has adequate protection when protected by the Elite Nexus Original’s hard exterior shell. It’s designed to resist heavy impacts, thus preventing your cue from scratching or chipping. The Elite Nexus Original has a handle prominently featured on one side – which helps you maintain a firm grasp of the case. It has even been covered in rubber, a material that helps your hands remain comfortable while carrying the case. For extra durability and style, you’ll have to pay a premium price for the Elite Nexus Original. These extra costs are well worth having a durable pool cue case, however. Two compartments help you organizes butts and shafts, while the oval shape gives the case a nice aesthetic. If you’re looking for a compact pool stick case that is also stylish, you can do no wrong with the CueSoul 1x1. Featuring high-end leather, this case presents a sophisticated look that helps you make statements at any pool venue. An adjustable strap ensures a comfortable, secure fit. A small pocket in the middle enables you to store items like pool tips and chalk. It’s hard for other cases to match the aesthetics presented by the CueSoul 1x1. Premium leather not only makes statements, but ensures a long-lasting design that saves you from costly replacements. It’s a true stylistic gem. Having extra storage is important for pool players, and the CueSoul 1x1 has it in spades. The zipper pocket gives you plenty of room for your daily pool essentials, and it’s perfectly placed to not detract from this case’s overall flow and design. The CueSoul 1x1 is moderately priced and is the perfect pool stick holder for players of all experience levels. From its striking visuals to its extra features, it’s a pool cue case that never fails to deliver on protection and sophistication. 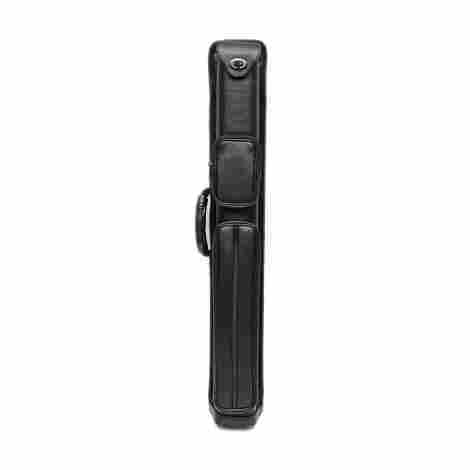 The Pro Series Premium pool cue case is renowned for its ample space and multiple storage compartments. Featuring brown leather that’s easy to maintain, this case blends style and practical function perfectly. Moisture-wicking fabric has even been lined on the interior – which provides adequate protection for your pool cue. It can hold a total of 4 cue butts and 8 cue shafts. You never have to worry about being without pool accessories when you use the Pro Series Premium case. Each accessory pocket has ample space – helping you keep all of your pool items in one place. Traveling for pool games has never been easier. For the experienced pool players that have multiple pool sticks, the Pro Series Premium case is ideal. It can store multiple cues at one time, saving you from needing a pool cue preference. All of your sticks will be safely anchored inside. For its size and various accessory pockets, the Pro Series Premium is priced fairly. Its soft design makes it comfortable to travel with, while the brown leather looks nice for any pool occasion. Best of all, this case lets you carry multiple cues at a time so you’ll be ready for any event. 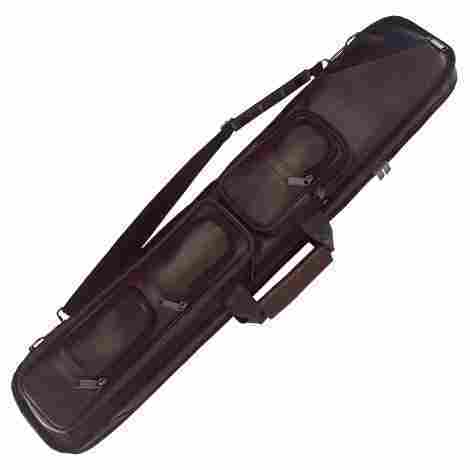 A moderately sized pool cue case is the Action Vinyl, which can hold two butts and two shafts at a time. It comes loaded with everything, including a carrying handle, shoulder strap, and multiple pockets that zip up. It even includes felt lining for a unique visual that never gets old and feels great when touching your skin. A highlight feature for the Action Vinyl pool stick case is the vinyl covering that is elegantly wrapped around the entire body. It comes in various colors and has a soft touch – which is important if you’ll be carrying this case around for a while. Where the Action Vinyl beats out a lot of other pool stick cases is with its simple design. It has just the right number of pockets, holds the right number of butts and shafts, and showcases a timeless style. Even though the Action Vinyl is one of the more expensive pool cue cases on the market, you get what you pay for. The materials are high-quality and placing butts and shafts inside can be completed with little effort. All in all, this case is a well-rounded choice that will serve its purpose perfectly. For those formal pool gatherings, you can show off your cue in style with the 2x2 Pro 2B4S. It is comprised of a durable, elegant leatherette material that stands out from all angles. Thanks to its durable construction, you can rest assured this case will last through whatever you put it through. 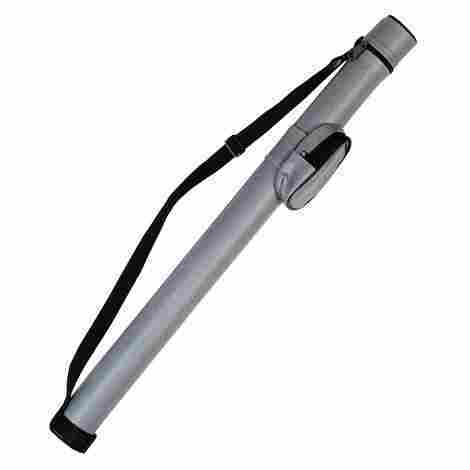 It even has a rubber handle that provides you with maximum grip. You’ll be ready for any pool occasion thanks to the distinct visuals given off by the 2x2 Pro 2B4S. The leatherette material showcases class and it’s thick enough to safeguard your pool cue from many external threats. You’ll have a peace of mind when transporting your stick in this case because of its extra padding, on the interior and exterior. The cushion helps protect your cue in the event of falls or bangs against hard surfaces. Since the 2x2 Pro 2B4S does feature high-end leather, you’ll pay more for this case. If you do, you can rest assured your stick will be protected and presented in a sophisticated way. You’ll also have plenty of room to work with. The 3x5 Sports Series provides the right amount of security you’ve been looking for. Its heavy-duty design shields pool cues from scratches and chips, while the vinyl material is perfect for showing off a unique design. You don’t have to worry about the case slipping off at any point thanks to its non-slip shoulder pad, which is easy to wrap around your body. The case is also uniquely designed to resist wear and tear. Even if you put the 3x5 Sports Series case through a lot, it will retain its structure and striking aesthetics. You can thus worry less about replacement costs, even after years of use. Since a large storage compartment has been equipped on the side, the 3x5 Sports Series case gives you plenty of room for items like gloves, chalk, tips, and hand towels. The zipper ensures a tight seal. Sports Series is a brand that’s affordable and one you can trust. This sleek case can get you through it all and still hold up thanks to its durable design. The vinyl wrapped material gives the cue a premium aesthetic that you’ll never get tired of looking at. The Elite 2x2 enables you to transport 2 butts and 4 shafts in a convenient and effective way. Two external pockets help you keep pool essentials in one place, while the lid at the top has a quick-release latch for easy loading and unloading. A shoulder strap provides adequate support while you’re mobile, and the carrying handle to the side gives you maximum control. Since the lid at the top has a quick-release hatch, you can quickly send butts and shafts through without any hassle. This design is ideal if you’re in a hurry to your pool destinations. From the way the external pockets are attached to the poured rubber casing, the Elite 2x2 is a well-built pool cue case that you can always rely on. Every component on this case has a purpose. The Elite 2x2 ranks up there as far as price, but these extra costs give you a functional pool case that has a premium aesthetic. It’s designed for any pool player looking to house multiple shafts and butts with ease. One of the most diverse and well-made pool cue holders on the market today is the Billiard Pro 3B6S. Featuring an adjustable shoulder strap and large pockets, this case is diverse and fully capable of protecting 3 butts and 6 shafts. Dividers inside help you keep your pool gear protected and organized. A hard vinyl material is both practical and stylish. Not many pool cue cases have dividers on the inside like the Billiard Pro 3B6S. They help you keep shafts from moving around. This dividing mechanism is built from durable plastic that will resist wear and tear. You will be ready for any pool adventure since the Billiard Pro 3B6S comes with a storage pocket that’s placed conveniently near the top. It can hold multiple items, such as chalk, tips, and other accessories. 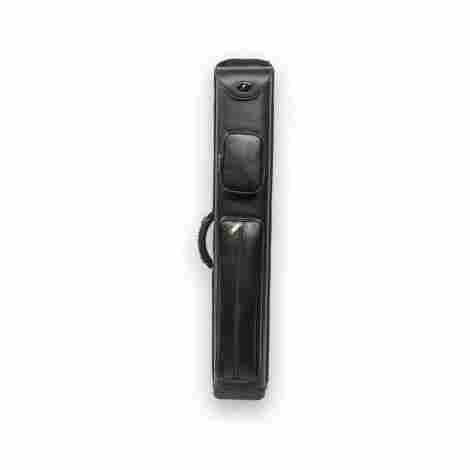 The Billiard Pros 3B6S is a pool cue case on the lower end of the price spectrum. It’s perfect for players looking for a good mix of stylish materials and supportive interior components. No matter what type of pool cue you play with on a regular basis, you need a way to protect it and make it easier to travel with. A pool cue case can satisfy these requirements, and there are so many different types to choose from today. Out of all your options, though, the previously mentioned list of 10 are true winners on the market currently. They are great for players of different skill sets, from beginners to advanced professionals. Each of these pool cue cases has its own unique attributes, but almost all are fully capable of protecting your pool equipment and showcasing a distinct style. Whichever pool cue case you’re thinking about purchasing, keep in mind its price, materials, design, and special features. Assessing these factors will help you choose the perfect case for your pool cues. Then, you’ll have a peace of mind no matter where you travel with your pool gear. When it comes to choosing a pool cue case, it’s paramount that it has the right covering material. After all, this material will determine how much protection your pool cues have when being transported from location to location. Some materials are better than others when it comes to providing adequate protection. Hard plastic is one of the most durable covering materials you can choose for the exterior. This is particularly true if the plastic is thick and resistant to cracking and bending. Pool cues that are stored in a hard plastic case won’t easily damage, even if the case is accidentally dropped. A hard plastic covering material also enables manufacturers to give these cases a structurally sound shape, such as oval and rectangular. Rubber is another covering material that you should look for in a pool cue case. It’s usually lined around the corners and sides so that if the case gets dropped, the rubber helps absorb the impact. Pool cue cases inside thus won’t receive this impact and be susceptible to breaking. Rubber covering on the exterior also serves a gripping purpose, which helps you secure the pool cue case against your body during transportation. Leather may not sound like a very durable material, but it can be so long as the leather is thick. Much like the rubber covering material, thick leather can help absorb impacts that these cases will face over the years. Pool cue cases today range a lot in terms of their carrying capacity. This is one of the most important features to assess because it varies from case to case. The carrying capacity that you need depends entirely on how many pool cues you plan on having. If you’re a beginner, the carrying capacity of your case may not need to be that large. A case that supports one pool cue may be all that you need. As a beginner, you’re just trying to learn the basics of this game. You thus just need one stick so that all of your shots are consistent. Choosing a 1×1 case will suffice for your playing needs in this instance, and since these cases are not as large, they won’t cost nearly as much. Conversely, if you play a lot of pool, you probably rely on different pool cues. Some cues may be reserved for competition, while other cues may be strictly for trick shots. If you fall into this category of playing, you’ll need a case that has a large carrying capacity and can support more than one cue. Cases that you should look for include 2×2, 3×3, 2×4, 3×4, and 4×8. You’ll have plenty of compartments for your butts and shafts, and you can keep them all in one place for easy access. One of the primary reasons you’re investing your hard-earned money in a pool cue case is to make transporting your pool cues easy. There are many ways you can transport these cases, but two of the most common components are straps and handles. When looking for the right carrying strap, it’s important that it has an adjustable design. So, no matter what body type you have, you can adjust the strap until you find the perfect position on your shoulders. Adjustable straps also ensure the case is tightly secured on your body. Then if you move real fast or accidentally stumble, the pool cue case will remain around your shoulders. You thus don’t have to worry about expensive damage occurring. In terms of the handle, there are many factors to pay attention to. For example, the material of the carrying handle is important to assess. Rubber, in particular, is a great material for helping you retain grip. 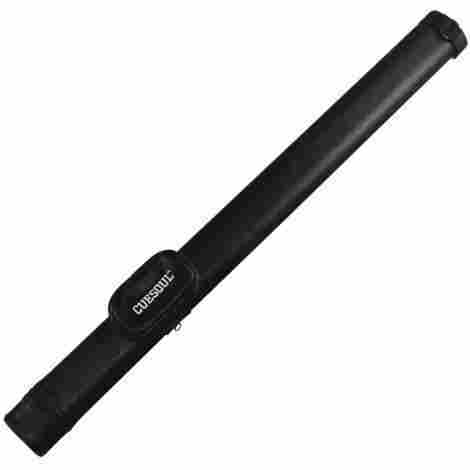 It’s also usually weatherproof, so if your pool cue case is left outside in the elements, the rubber will hold up. It’s also important that the handle has a textured grip. This design enables your hands to fit better on the handle, which is key if you plan on carrying the case around for hours. Lastly, pay attention to the handle’s size. It should be big enough to where your entire hand can fit inside comfortably. For this attribute, you may need to try out the pool cue case in person to ensure your hand fits inside correctly. The lining of a pool cue case plays an important role: it keeps your pool cue from moving around and prevents it from getting severely damaged. Today, there are many great lining options you should consider for pool cue cases. Soft foam insert is what a lot of pool cue cases feature today, and for good reason. It compresses once pool cues are placed inside – which prevents them from moving around. With this added stability, you don’t have to worry as much about your cues jostling around and hitting against each other when you’re mobile. Foam inserts also help you protect pool cues from impacts – whether the case is banged against objects or is accidentally dropped. Plastic molds are a little more specific as far as what pool cues they can hold. They have particular dimensions, which means you need to ensure the molds are designed to secure your pool cue type. Once you do get the proper fit, these molds are one of the best options for keeping your cues stationary. Plastic molds are also extremely durable and they enable you to snap your pool stick parts in. Once you hear an audible clicking sound, you’ll know that your pool equipment is ready for transportation. Soft felt is an interior lining option that is widely used by a lot of pool cue case manufacturers. It’s one of the more inexpensive options, and it should only be considered if you’re focused more on style – as opposed to functional protection. Today, soft felt comes in many different color varieties. Even though soft felt doesn’t provide ample cushion like other lining options, it does provide traction. You can thus keep pool equipment in place and organized, even when you pick up the case and move it around. Q: Are pool cue cases required? A: While pool cue cases are not required to play pool, they are certainly recommended. After all, they are intended to keep your cues protected during transportation. Investing in the right pool cue case can save yourself from dealing with expensive repairs later down the road. Additionally, you’ll want a pool cue case if you’ve invested a lot of money into a pool stick. Once your stick is secured properly in one of these cases, you can worry less about severe damage occurring. Q: Can these cases hold full-sized sticks? A: No, almost every pool cue case available on the market today is not intended to support a full-sized cue. Instead, the cue will need to be broken down before inserted into the case. Pool cue cases do fully support butts and stocks, which sometimes are stored in separate compartments. You’ll thus have an easier time grabbing particular components when they’re needed. Q: Are there pool cue cases that are waterproof? A: Today, there are plenty of pool cue cases that are made to be completely waterproof. No matter how much they get wet, specialized seams and materials ensure water doesn’t get inside the interior and cause unnecessary destruction to your pool equipment. However, it’s important to verify that a pool cue case has a waterproof rating. This will be indicated somewhere in the description. Always make sure this rating is visibly present before thinking your pool cue case can get wet. Q: What are the best brands? A: Today, there are some great brands to look for, including Billiard, Elite, Outlaw, Scorpion, Voodoo, and Predator. Whatever brand you’re contemplating, make absolutely sure that it’s backed by positive customer reviews. This is particularly true if you decide to purchase a brand that’s not listed up above. The more reviews you assess, the better idea you’ll have as far as a brand’s reputation. Only then can you make the right brand selection with confidence. Q: What are the benefits of using a pool cue case? A: Putting your pool cues in a case can benefit you in many ways. First and foremost, it will ensure your pool cues are protected. They will thus last much longer and not be as prone to chipping, especially if you put your cues up after every game. These cases also make carrying multiple cues at a time easy. The compartments inside give you ample space, and some cases even come with individual dividers that give your cues additional support. Lastly, pool cue cases give you the chance to flaunt style and unique visuals. There are so many colors and graphics that these cases feature. You can thus choose an aesthetic that matches your stylistic preferences and perhaps vibes with your pool cues. Q: How long do these cases last? A: How long your pool cue case lasts depends on several factors. One of the most important is the material that the case is composed out of. Some materials will last longer than others, such as leather. As long as it’s properly maintained over the years, leather pool cue cases can last decades. Cases made from metal also have a long-lasting design. You’ll pay more, but you won’t have to worry about having to replace these cases any time soon. The lifespan of these cases is also determined by how the case is used. Obviously, when you use these cases as they are intended to be used, you can prolong their lifespan. Q: How do these cases open? A: Pool cue cases are fairly simple to open. A lot of them feature a zipper design, which you’ll just have to move all the way down to gain access to the inside. Some cases, such as box-shaped cases, open via clips. All you need to do is push these clips up to get to the interior. Then there are pool cue cases that have a liftable lid at the top. Once this is opened, you can slide your pool cue components inside and you’ll be ready to take off. Q: Can these cases be locked? A: Most pool cue cases today can’t be locked. They can, however, be clicked in or sealed to ensure your pool cues don’t fall out while these cases are moved around. Since these cases usually don’t feature a lockable design, you’ll need to be extra cautious where you place them. Make sure you don’t leave them unattended in plain sight. Q: Will stickers stay on? A: If you’re looking to add stickers onto these cases to customize them, just note that some materials take stickers better than others. Plastic works extremely well for sticker application. This is particularly true if the plastic features a smooth surface. One material that you’ll want to avoid when applying stickers is leather. Stickers will stay on initially, but over time, temperatures and other factors will make the stickers less sticky and cause them to fall off. This may not be as much of an issue, though, if you plan on just showcasing several stickers on your case for a short tournament or game with your friends. Q: Are pool cues included? 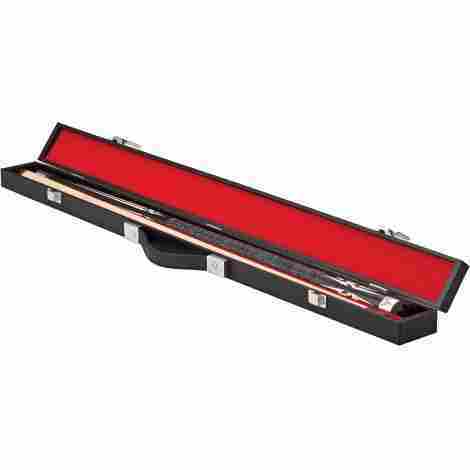 A: There are some pool cue cases that come fully equipped with their own pool cue. This generally varies from brand to brand. To see what does and doesn’t come with your pool cue case, check the product description. There, you will find what items are included in your case. It’s also important to note that you’ll pay significantly more for these bundled packages, as opposed to just purchasing for the case itself. Q: Is custom text available? A: Some case manufacturers do give you the option of having custom text included in your case for a personalized look. However, for these custom text services, you’ll pay more. Also, it will take much longer to get your pool cue case if it’s receiving custom text. This is something to take into account if you need your case quick for an upcoming tournament or game with your friends. Generally, the costs of this personalization service depend on the amount of text used and the colors that you choose. Black and white is more affordable than colored text.